Learn proper body mechanics need to successful in the throwing events. 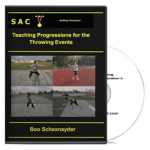 In the video below, Boo Schexnayder demonstrates two exercises designed to teach upper and lower body mechanics in the throwing events. In addition, the med ball drills will teach the proper integration of the upper and lower body in the trowing motion. These drills are simple and easy to follow, allowing the thrower to focus on basic mechanics during each phase of the throw. Coach Schexnayder is former LSU assistant coach and regarded as one of the world’s premier field event coaches, he currently serves as the Director of the Track and Field Academy, the educational branch of the US Track and Field and Cross Country Association. The two exercises below are double arm exercises. The simplicity of these drills allows the athletes to focus on basic mechanics and eliminates in distractions that the strike may cause. The drills are demonstrated in the video below. The athlete kneels in front of a wall with their shoulders square to the wall. The athlete holds a med ball at chest level. Before striking the ball the athlete will rocks backwards and then moves forward before striking the ball towards the wall. This helps to teach that the strike occurs after the core as initiated the movement of the ball. The strike is a pushing movement with the thumbs should pointed downwards as the wrist extends at release. The athlete is positioned in the same fashion as the drill above. In this drill the ball is initially placed above the head and slightly behind the head. The forearms should be turned outward slightly so that the elbows are wider than the shoulders and wrists. The elbows should be flexed slightly. The athlete rocks back and then moves forward. As before the athlete will strike the ball only after they have initiated forward movement with their core. Upon release the thumbs should be pointed downward due to pronation. The video below is courtesy of Complete Track and Field, a collection of great resources for coaches. The YouTube video has audio, so please make sure that your sound is turned on and that you have access to the site. Note some schools block access to YouTube.